Tabberone's Hall of Shame - Sevenarts Ltd and Chalk & Vermilion Fine Arts. In October 2008, a settlement agreement was signed that ended this dispute. Look at the two pictures above. Erte, a fashion designer, to the left, and Betty Boop, a cartoon to the right. Welsome to a comedy of the absurd. Erte is elegant; Betty Boop is pedestrian. 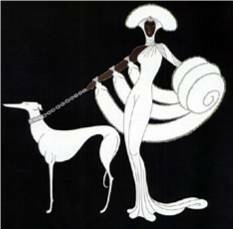 Erte has carfully structured lines and grace and characterizes the upper class; Betty Boop has her dog Pudgy and characterizes the wannabees. People who buy Erte do not buy Betty Boop (in more than one way). Around 2001, Shamash & Sons, a well-known fabric manufacturer, released some fabrics depicting Betty Boop in a variety of poses wearing fancy dresses. One fabric, that which we call "Lush Life", portrayed Betty Boop in a bright dress while surrounded by gold stars. The other depicted Betty Bopp in about six different poses on a black background while wearing a variety of fancy dresses. The fabric also contains the title, "elegance", as shown above. Seems there are some graphic arts designs from the 1930's through the 1980's by a Russian artist named Erte that look a lot like some of the dresses Betty Boop is wearing on those fabrics. Sevenarts Ltd located in London, claims to own the Erte rights in the US, the civilized world, Space (the final frontier), and beyond to some distant galaxy far, far, away. The agent for Sevenarts in the US is Chalk & Vermilion Fine Arts, located in Connecticut. Guess what? Sevenarts, through its US agent, Chalk & Vermilion Fine Arts ("CVFA"), is shutting down eBay auctions selling these Betty Boop fabrics, alleging the fabrics infringe upon Erte copyrights. But, and there's always a but, they claim they contacted Shamash & Sons who agreed the fabrics were infringing, and Shamash & Sons admitted they violated their copyright. Yet, they, the fop twins, Sevenarts and CVFA, have nothing in writing. Seems the fop twins also didn't demand Shamash & Sons withdraw the frabrics from the market and contact anyone to whom they might have sold the fabric and warn them of the alleged infringment. That might have been an intelligent move but why should the fop twins start now? Seriously folks, what reasonable person would say that Betty Boop printed on a cotton fabric, sold in chain stores throughout the United States, at $6.99 a yard, wearing any gown, would take sales away from high-end products like Erte at $2,000 for a poster? Since no reasonable person would believe a loss in sales we must then assume, accuratelty we believe, that the person running Sevenarts, Ray Perman, and the couple running CVFA, the Rogaths, are flaming idiots. Their actions support our beliefs. Sevenarts and CVFA lose jurisdiction appeal! On January 28, 2008, the Tenth Circuit Court of Appeals ruled against Sevenarts and CVFA concerning jurisdiction. For the decision in HTML format, click here, for the decision in PDF format, click here. Now, they have to fight the issues which they have avoided. Indeed, CVFA was telling people two years ago a lawsuit over the fabric was pending but to date there is nothing! But, they persist in punishing "innocent" infringers (their term - we maintain we are not infringing). Based upon the results of Chalk & Vermillion v Thomas F. McKnight, LLC, where CVFA sued Thomas McKnight for breach of contract, we wouldn't trust CVFA a whit. Not only did the jury reject the allegation, but the NY Court of Appeals slapped them down twice, rejecting two appeals by CVFA. CVFA wanted to get out of paying for what they ordered. Hmmmm. Not what we would consider to be stellar conduct. Thomas McKnight posted his version of the court decision. We wonder what ever made C&V think a Court of Appeals would overturn a unanimous jury verdict in a civil case? Drain Bammage, perhaps?